Transportation is charged at $72.00/hr and includes hauling, launching, and rigging. Mileage is charged at .58/mile for long distance hauls (over 3 hours) plus any tolls. Beetle Cat Inside Storage is $475 per year. Inside storage of other boats is charged at $6.75/sf. Outside storage of boats on trailers is charged at $3.85 per square foot. There is no charge for short term storage of new boats or repair boats awaiting delivery or customer pick-up. There is no charge for survey or estimate if the boat is brought to the shop. Otherwise, $72.00 per hour if we come to the boat. As builders of the Beetle Cat boat, we are uniquely qualified to provide repair and maintenance services of the highest quality at reasonable prices. When boats come in for repair or maintenance, a free survey is done. The shop and the owner discuss costs and agree on what work (if any) is to be done. Before work begins, the owner is provided with a written estimate of the total price and will never be billed for an amount higher than that price. A deposit of 50% of the estimate is due before work begins. The balance is due upon completion. Shop labor for all Repair work and Maintenance (paint and varnish) are billed at $72 per hour. 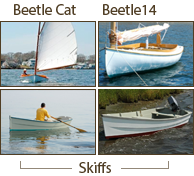 Beetle Cat rentals will be from our shop location, and will consist of a Beetle Cat Boat, on a trailer, ready to be picked up and sailed. The rental price is $800 a week or $2,400 a month. A 25% down payment is required to reserve a Beetle Cat. Cancellations must be made at least 2 weeks before the rental date, or the down payment will be forfeited. 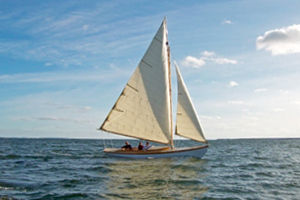 Arrangements can be made for delivery, rigging, and/or sailing instructions, for an additional charge. Beetle, Inc. maintains a list of used Beetle Cats for sale. All boats are sold from in-house only. Beetle, Inc. charges a 10% commission from the seller on the actual sales price of the boat. Inside storage will be charged at the rate of $95/month, with a maximum of $475/year.